TOKYO -- Toyota Motor Corp. forecast full-year profit that fell short of analyst estimates as declining sales from a loss in output and a stronger yen eroded earnings. 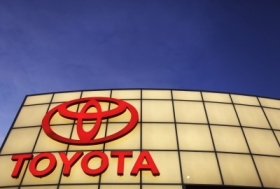 Net income may decline to 280 billion yen ($3.5 billion) in the 12 months ending in March, from 408 billion yen a year earlier, Toyota said in a statement today. That compares with the 421.8 billion yen average of 13 analyst estimates compiled by Bloomberg in the past 28 days. "Toyota will do its best to recover from the delays in delivery," said Satoshi Ozawa, Toyota's CFO, in a briefing in Tokyo today. The output disruptions after the record magnitude-9 earthquake may cause Toyota to fall behind General Motors Co. and Volkswagen AG in global sales this year after Akio Toyoda's first full year as president was dominated by recalls of more than 10 million vehicles for problems related to unintended acceleration. Toyota expects domestic production will recover to 90 percent of normal levels this month, with global production to normalize by December. Toyota expects global sales to drop to 7.24 million vehicles this fiscal year from 7.31 million last fiscal year. The lower sales will reduce earnings by 120 billion yen, the company said. Toyota, which is basing this year's profit forecast on an exchange rate of 82 yen to the dollar, said the stronger yen may cut profit by 100 billion yen. Japan's currency soared to a postwar high of 76.25 per dollar on March 17. The stronger yen cut operating profit by 290 billion yen in the year ended March 31, Toyota said in May. That was more than the 110 billion-yen cost from the earthquake. The automaker, which built 45 percent of its cars in Japan last year, may need to produce more abroad because of the yen's strength, Ozawa said last month. While Toyoda said he wants to protect jobs and Japan's manufacturing culture, the automaker's profitability is suffering with the yen close to a post-World War 2 high and German and South Korean rivals benefiting from weaker currencies and free trade agreements. The currency and the impact of Japan's record earthquake contributed to Toyota's fourth-quarter profit falling 77 percent from a year earlier, the company said in May. Toyota's ratio of domestic production is higher than Japanese rivals. Nissan made 25 percent of its vehicles in Japan last fiscal year, while Honda produced 26 percent of its cars at home. The company expects global production to return to normal by November or December this year, Ozawa said, reiterating the company's forecast.